Happy world circus day – bag a discount for Bianco tickets ONLY on 18 April 2015! As the Big Top goes up, prices come down: NoFit State celebrates World Circus Day with discounted prices! To celebrate World Circus Day, NoFit State are offering a special 10 per cent discount on tickets to see their award winning show Bianco, showing 12 – 27 June 2015. World Circus Day is on Saturday 18 April, and the discount will be available until midnight that day! This weekend NoFit State will be erecting their famous silver spaceship shaped Big Top outside their HQ on John Street in Cardiff city centre. Over the coming weeks the company will be rehearsing and re-creating their show Bianco under the guidance of acclaimed director Firenza Guidi. The show will open to the public from 12 – 27 June, and is complemented by the Street Food Circus that will be popping up in John Street between May – June. 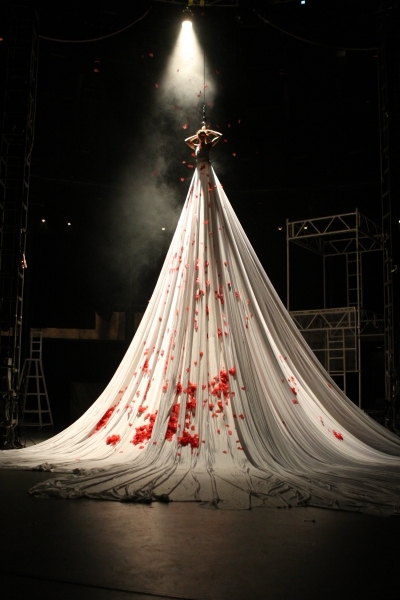 Bianco is an immersive promenade circus experience that takes place above, behind and all around a standing audience. With a constantly evolving narrative set to a pounding soundtrack performed by a live band, this is an all consuming theatrical experience that is not to be missed. To claim the discount, you must book on 18 April using the code WORLDCIRCUS online at www.nofitstate.org or by calling 0333 222 9000 (local rate). DO IT NOW!